Prostate cancer, or adenocarcinoma, is a malignant tumour originating in the glandular tissue, in this case the tissue of the prostate gland. It can grow and metastasize rapidly to other parts and organs of the body, including the lungs, bones, and lymph nodes. 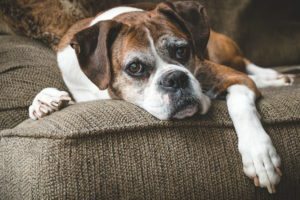 Prostatic adenocarcinoma is seen in both intact and neutered dogs. It can develop in any breed, but it most commonly affects large breeds. 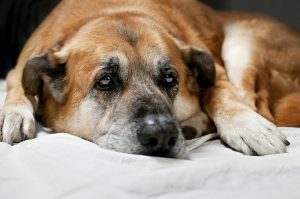 Like most carcinomas, it affects older dogs between the ages of 9-10 years. The causes are not known though in some instances hormones may be implicated. You will need to give a thorough history of your dog’s health, including a background history of symptoms. Your veterinarian will perform a complete physical examination on your dog, including blood tests and a biochemistry profile. Urine tests are an important part of the diagnostic process. Abdominal radiographs and ultrasonography may also be performed to view the symmetry, size, and outline of the prostate gland. A prostate tissue biopsy will also be taken to confirm the diagnosis. There is no single definitive treatment. Radiotherapy and chemotherapy are sometimes the chosen therapy and may increase the survival time. Due to proximity of the prostate gland with the urethra, removal of the prostate gland by surgery is difficult; postoperative complications are high and difficult to manage. Dogs with prostate cancer face permanent difficulties with urination and defecation. Inability to urinate and defecate properly is often accompanied by severe pain, restlessness and great discomfort. Observe your dog especially during its urination and defecation routines and inform your veterinarian if your dog is not able to pass urine or faeces effectively. Follow your veterinarian’s guidelines. During this period you can improve your dog’s quality of life by providing extra comfort and affection.